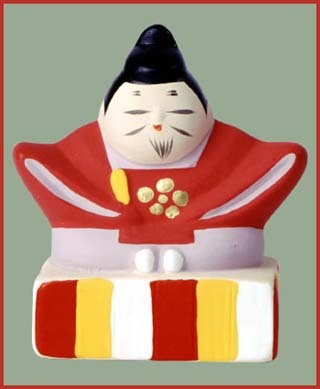 a Shinto god of learning, TenmanTenjin 天満天神, shortened to Tenjin. He was a vengeful spirit, goryoo, onryoo 御霊、怨霊 and had to be appeased as a deity.
. Sugawara Michizane　菅原道真 (854 - 903).
. Tenjin Sama 天神さま, a popular toy . The festival for the Protector Deity at the Kitano Jinja is on September 25. Tenjin Sama leaves early for Izumo to meet with the Deities of Japan and to help making Sake. So people offer Amazake and 赤飯 Red Ritual Rice on this day.
. 甘酒と伝説　legends about Amazake "sweet rice wine" .
. ushiishi, ushi-ishi 牛石 "bull stone" .